On November 24, 1989, Elias Hraoui was elected President of the Lebanese Republic under extremely difficult security conditions, after the assassination of President Rene Mouawad. 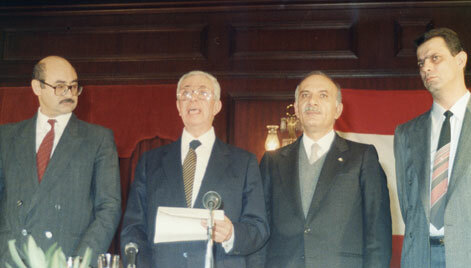 In 1995, his presidency was extended for a term of three years. President Elias Hraoui was a model of courage and endeavor in Lebanon's emergence from war to civil peace. He faced crisis, with patience and tenacity, and worked relentlessly during 9 years to anchor national unity, restore vitality to Lebanese life, rebuild the Republic, launch the process of reconstruction and liberation, and establish sovereignty on all Lebanese territory. The President made sure the collection of his presidential speeches was published in a three-volume book, starting with his acceptance speech on November 24, 1989 and ending with his farewell speech on November 22, 1998. This section of the website contains the most prominent speeches. 1- Camille Menassa, Elias Hraoui, Building the Republic: From Segmentation to Unity, 2nd Edition (Beirut: Dar An-Nahar and Raidy Printing Press, 2002), p. 42. Lebanon: From Crisis to Peace, Words and Stances, 1989-1995, Volume One and Volume Two (Beirut: Dar Al Andalos Publishing). Cementing the State of Institutions and Reconstruction, Words and Stances, 1995-1998, Volume Three (Beirut: Joseph D. Raidy Printing Press).